Prasanth Mohan Assistant Professor, Department of Anaesthesia, Sree Narayana Institute of Medical Sciences, Chalakka, Ernakulam. Aneesh Lakshmanan Associate Professor, Department of Anaesthesia, Sree Narayana Institute of Medical Sciences, Chalakka, Ernakulam. Moni Ann Thomas Professor, Department of Anaesthesia, Sree Narayana Institute of Medical Sciences, Chalakka, Ernakulam. Background: Minimizing the damage to facial nerve is a matter of utmost priority for a surgeon during parotidectomy. The use of long acting muscle relaxants are avoided as it might hinder identification of the nerve.Transtracheal injection of a local anaesthetic is believed to result in a reduction in requirement of depth of anaesthesia intraoperatively. 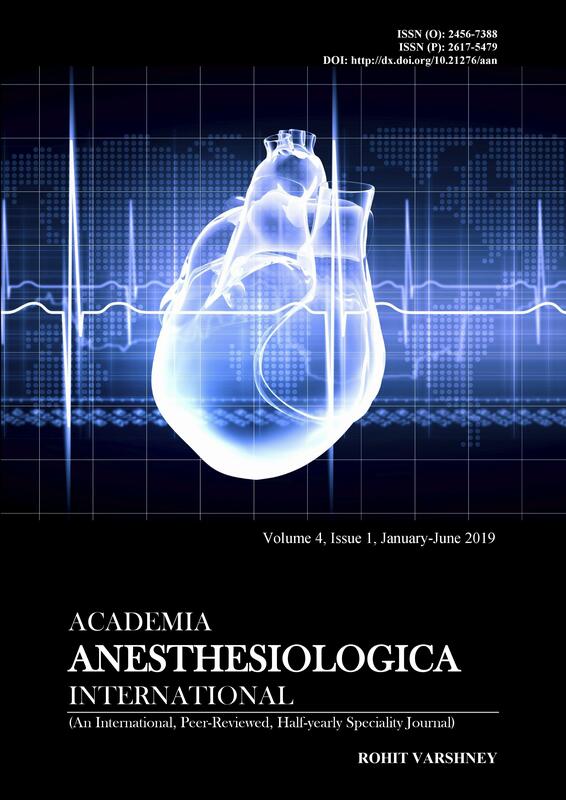 Objective: To compare the intraoperative propofol consumption, patient's immobility and haemodynamic stability during total parotidectomy under GA, with and without use of a transtracheal block using lidocaine. Subjects and Methods: An observational study was conducted in the Department of Anaesthesia, Amrita institute of Medical sciences and Research centre - Kochi, among 40 patients undergoing parotidectomy under GA, during the period March 2013 to September 2014,with 20 patients receiving an additional transtracheal block using lidocaine and the rest without any additional block. Heart rate, systolic, diastolic and mean arterial blood pressures were documented at various time intervals. Intraoperatively total propofol consumption (bolus and infusion) and number of patient movements, if any, were documented. The data thus collected was properly coded and entered in Microsoft Excel and analysis was done using the software SPSS version 16.0. Results: Intra operative propofol consumption and patient movements were significantly lower in group which received trans tracheal block.Mean heart rate, systolic blood pressure, diastolic blood pressure as well as mean arterial pressure at various time intervals were comparable between the two groups. Conclusion: Trans tracheal block can be practiced as a safe alternative to propofol infusion during surgeries where muscle relaxants are to be avoided.